We've been blessed at Ignition to have NFL, college and youth athletes all training with us this summer. With the uncertainty of the length of the NFL Lockout, you never know who you might run into at Ignition this summer. Youth athletes have been wide-eyed and excited to be working out next to some of the NFL's best athletes. Not only are they working out in the same facility, but the NFL players' have been great interacting with the kids. Last week, Domata Peko stopped to talk with a group of "FAST" session athletes giving advice and words of wisdom. These youth athletes are getting a great opportunity to not only see how hard these professional athletes work but also learn that they're great people as well. 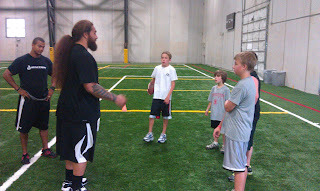 Bengals' Rey Maualuga even gave one of our youth athletes some personal advice at the end of a session last week, "make sure you're drinking protein shakes and doing push-ups every night before you go to bed!"